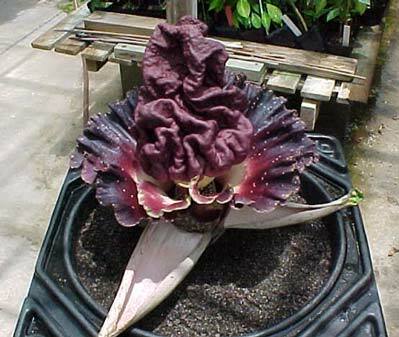 After the tuber was planted in a 133 liters pot in April, 1999, the inflorescence was fully open on June 4. The cataphyll enclosing the spathe split and is lying at the base of the inflorescence. That evening the inflorescence began emitting a horrifically putrid smell that seemed to come in periodic waves of gas that easily induced nausea. The only practical way to deal with this phenomenon is with a gas mask! During this first day of opening, and especially during the period when the bad smell is being emitted, the female flowers of the spadix are at their peak receptivity for pollination.